You have to give SJ forward Evander Kane credit for taking a run at Zdeno Chara. Even at the ripe old age of 41 Chara can still handle himself as he demolished the much younger Kane quickly. The fight highlighted how today’s NHL is rapidly becoming a mix of pinball and women’s croquet. The speed and finesse may be fine, but hockey has always meant to be a physical sport. And when you fill a man’s game with 5’8 players where would you think contact would occur when you have a 6’9 player? 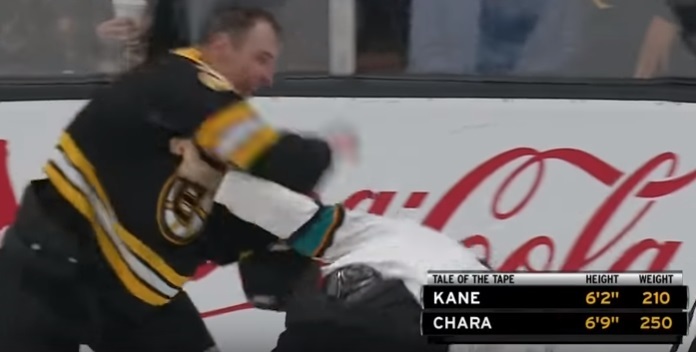 Watching the replay shows that there was some boys being boys stuff, but clearly there was no victim and Chara wasn’t going out of his way to initiate Kane who is a rare power forward in today’s NHL. Players like Kane and Tom Wilson of the Caps are showing the importance of size and how you use it. Now if the refs will let D men clear the net we might see less goalie injuries and more action. Seeing a NHL game with only 3 penalties called is frankly, painful, to a real hockey fan.